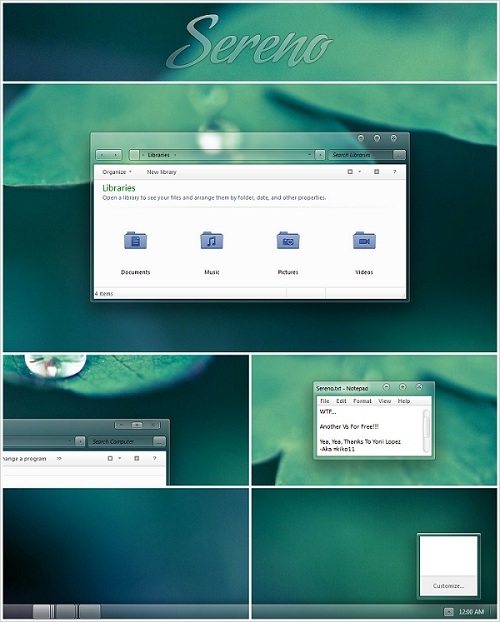 Windows 7 Theme Sereno is a visual style with minimalistic frosted glass appearance. The themes available for both of the two versions of Windows – 32 bit and 64 bit. Windows 7 Theme Sereno is created by kiko11. We published other great works by the developer before. This Visual Style is for Windows 7. Windows 7 Theme Sereno works on both 32 and 64-bit. Included system files are for Service Pack 1. Please note that, you have to replace ExplorerFrame.dll, Caption buttons, start orb etc for the full look. It is a 3.2 MB RAR download, also download ExplorerFrames.dll as well for fully working theme. This Article Has Been Shared 7916 Times! Windows 7 Theme Uniko is a refreshing Visual Style. One of the excellent Windows 7 Theme available still date. Windows 7 Theme Radiance is a refreshing Visual Style. One of the amazing Windows 7 Theme we have posted still date. Windows 7 Theme Puro is Purely Minimalistic Visual Style. The theme is available for both of the two versions of Windows – 32 bit and 64 bit. Windows 7 Theme Elemental Snow is an awesome theme that will change the look of your Windows PC to a completely different elegant look. How to install these themes download from here?????????? Click the link in the sentence : “Windows 7 Theme Sereno is created by kiko11.” You can ask the developer directly. Usually some dll files like ExplorerFrame.dll needs to be replaced with the supplied, the folder supplied needs to be added to themes folder. Do not proceed if you have not much idea about the system files. Cite this article as: Abhishek Ghosh, "Windows 7 Theme Sereno," in The Customize Windows, April 27, 2012, April 21, 2019, https://thecustomizewindows.com/2012/04/windows-7-theme-sereno/.